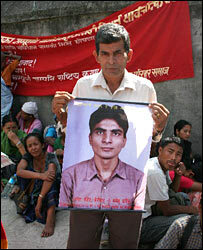 Ram Prasad Acharya disappeared four years ago. The last time his wife, Ruku, saw him he was being dragged out of their house by soldiers, wrapped in a blanket. It was 3.45 in the morning and he was not given time to dress. He is one of 937 Nepalese civilians who the International Committee of the Red Cross has listed as missing; their whereabouts still unknown, a year after the decade-long conflict ended. 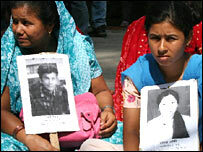 Most of the "disappeared", about 800, were allegedly abducted, like Ram, by the security forces, after the government declared a state of emergency in 2001, and ordered the army to crush the Maoist insurgents. Ruku believes Ram is still alive, probably still a prisoner, but perhaps wandering the country, having lost his mind. She is well aware that human rights organisations, and released prisoners, accuse the army of having tortured and killed detainees, and that most people think the bodies of the missing are buried in unmarked graves. "My heart feels very heavy. Sometimes I feel like I'm going to faint, I'm absolutely terrified." Ruku says Ram was suspected of supporting the rebels, who then had a strong presence in their home district, Dhading, about a one-and-a-half-hour drive from Kathmandu. Eighteen other people from the area were seized around the same time, suggesting that this was a deliberate tactic employed by local commanders. As the owner of a small roadside restaurant, Ram would sometimes be asked by the Maoists for food. He was not a supporter of their "People's War", but an innocent caught between the two sides, his wife says. "They [the Maoists] didn't come here very often, and there was nothing we could do to stop them." After he was seized, Ruku tracked him to an army barracks in the capital. Other suspects, who were later released, told her they had met Ram there. "We didn't know where they had taken him at first, but then we heard he was taken to Jagadal barracks in Chhauni. "When we went there some of the guards denied he was there. Others guards said he was, but they wouldn't let us visit him, and they wouldn't give us permission to talk to their officers," Ruku said. 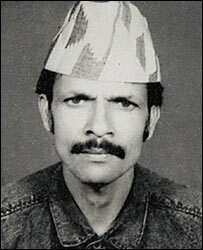 According to Colonel Dharma Baniya of the Nepal Army's Human Rights Directorate, there is no record that Ram Prasad Acharya was ever a prisoner of the military. He challenged the accuracy of the Red Cross figures, and said the victims' relatives, like Ruku, might have confused army personnel for members of different security forces, such as the Armed Police Force. "If we get some clues that we had done these violations we will punish the people and make these things public. But for those 800 cases there is no confirmed evidence we were involved. "Unless some organisation or some individual comes to us with some evidence, with some proof, with some witness, we don't believe those cases." Col Baniya says the army investigates all allegations made against it, and has punished 162 soldiers for committing abuses during the war. "Maybe in South Asia we are the only country whose army is so serious about the protection and promotion of human rights," he said. But the families of the missing do not see it that way, and feel let down by the government alliance, which is made up of the Maoists and seven mainstream political parties. When they signed their peace agreement eight months ago, they promised to reveal the truth about the disappearances within six weeks. More recently the Supreme Court ordered a commission to be set up to investigate and pay out compensation. "We've been deceived so many times," Ruku says. "Last year we went to the interior minister. He promised to reveal the whereabouts of all the missing within one week, but we still haven't heard from him." The problem, the relatives say, is that some current government leaders supported the decision to deploy the army against the Maoists in 2001, so they do not want the truth about their brutal tactics to come out. According to the Maoist's leader, Pushpa Kamal Dahal, commonly known by his nom de guerre Prachanda, forces linked to King Gyanendra, the then head of state, are blocking investigations. "There are some people, mainly the royalist people, who are responsible for these crimes against humanity, and they want to block, to derail this process," he told me at a rally organised by the Maoists to put pressure on the government. Their involvement in the campaign has led some families to accuse them of politicising what for them is a personal matter. Critics also point out that the Maoists are accused of covering up their own "disappearances". According to the Red Cross, they have not accounted for more than 100 of their own prisoners, something Prachanda completely refutes: "In our assessment this is a lie. All the Maoist prisoners have been released. They have not been disappeared. This is wrong, a fake charge," he told me. 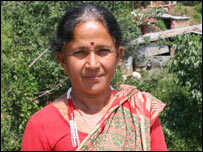 Back in Dhading, Ruku says she "hopes against hope" that she will soon discover what happened to her husband. A spokesman for Prime Minister GP Koirala says Ruku just needs to be patient; that the truth will come out now that the war is over. But, ominously, Nepal is not yet at peace. Journalists are often intimidated; there has been a wave of abductions of businessmen in the capital, and political violence is on the increase in the southern Terai region. The thuggish Maoist youth wing The Young Communist League regularly beats up and detains opponents, while their own leaders have been the victims of armed militants, who recently launched a campaign for greater regional autonomy.